"I'm going to do everything I can to deliver the best Venom that I possibly can muster." Sony has released the "live-from-the-set" video shown at Brazil's Comic-Con for the Venom movie, to begin building buzz for this upcoming Spidey spin-off set to hit theaters in October. Ruben Fleischer (Zombieland, 30 Minutes or Less, Gangster Squad) is directing, though not much is known about the plot yet, except that it takes place mostly in San Francisco. 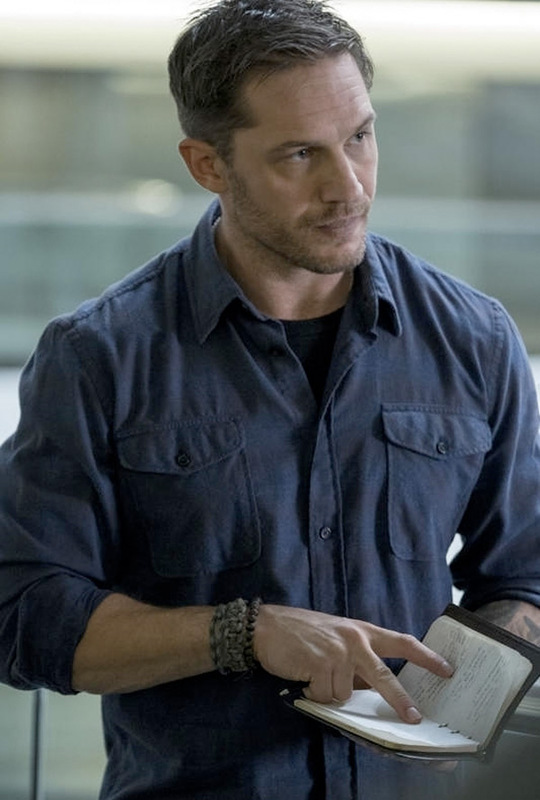 Tom Hardy stars as Eddie Brock, with a cast including Michelle Williams, Riz Ahmed, Woody Harrelson, and Jenny Slate. Fleischer drew inspiration from two comic runs: Lethal Protector, in which Venom moves to San Francisco and tackles five new offspring of the Venom Symbiote; and Planet of the Symbiotes, where Earth is invaded by an army of symbiotes. This video doesn't show much at all, but it is a cool introduction. There's also a fairly boring first look shot of Hardy as Brock to see below. No plot synopsis has been revealed yet. Details from Wikipedia: Development on this Venom film, a spin-off from the Spider-Man film franchise, first began with producer Avi Arad in 2007. After going through various iterations, an R-rated standalone film was confirmed in March of 2017. The intention was to begin a new shared universe featuring the Marvel characters to which Sony possessed the film rights, though Sony also intends for the film to share the world of Spider-Man: Homecoming, which is set in the MCU because of a deal between Sony and Marvel Studios. Rosenberg and Pinkner were set to write, with Fleischer and Hardy brought on-board in May of 2017. Filming began in October, in Atlanta and New York City. Venom is directed by American filmmaker Ruben Fleischer, of the movies Zombieland, 30 Minutes or Less, and Gangster Squad previously. The screenplay is written by Scott Rosenberg, Jeff Pinkner, and Kelly Marcel. Sony will open Venom in theaters everywhere starting October 5th this fall. Stay tuned for more updates.